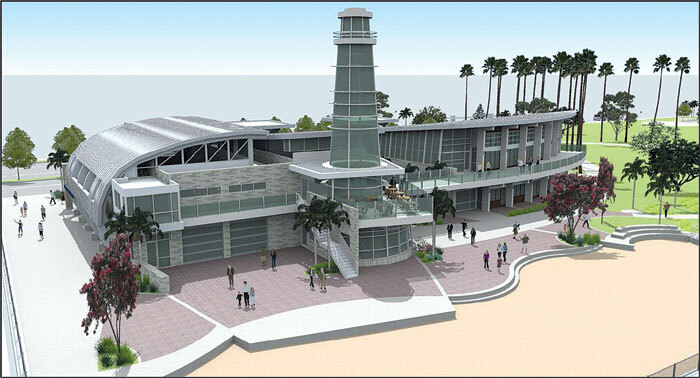 NEWPORT BEACH — The California Coastal Commission’s decision to allow the city of Newport Beach to construct a 71-foot faux lighthouse as part of the Marina Park project will bring an iconic structure to the harbor — although no beacon. With the commission voting 8-2 in favor of a land use plan that will include a tower with a height not to exceed 73 feet, the city’s vision for the park’s identifying feature will be realized. “This is a faux lighthouse: It will not be lit. So, I question the public safety aspect of this,” said Coastal Commissioner Esther Sanchez. “It just seems like more visual clutter than anything else. I’ve tried to think of it in a positive way, and I can’t,” she added. The commission ultimately sided with the city and approved the amendment, with language specifying that the exception only applies to the Marina Park project, so as to not set a precedent for future developments along the coast. Commissioner Brian Brennan supported the structure being built at the city’s requested height after visiting the bayfront and spending time on the water. He contended that the structure would not be visible to small sailboat users in the harbor if the tower was erected at 55 feet. “The 73-foot structure is going to serve a use,” he said. Coastal commissioners had approved the Marina Park project in June 2012, but they deadlocked on a motion to allow the community center’s lighthouse structure to be as tall as requested, leaving the height at 35 feet. The city applied for an exception to the land use plan in 2012. Marina Park, located between 15th and 19th streets along Newport Harbor’s Balboa Peninsula, will include a 23-slip marina and a 200-foot side-tie area, a 23,000-square-foot community and sailing center, and a waterfront park, on 10 acres of bayfront. Basketball half-courts, a children’s play area, restrooms, a new 5,500-square-foot Girl Scout building, a 157-space parking lot and access to a bayfront beach are additional amenities. Designed by Rabbe/Herman, along with Bundy-Finkel Architects, Marina Park is estimated to cost between $20 and $28 million. As soon as the construction date is posted, the city will provide a 90-day notice for residents of the 57-unit mobile home park that now occupies the site to vacate the area. After that time, the mobile home facilities can be demolished to make way for the project. Approximately 52 residents of the mobile home park entered into a settlement agreement with the city in 2007, with the city paying for $35,000 for each unit and slightly lowering the rent for the remainder of the residents’ stay on the property. After a decade of planning, Marina Park is steps closer to breaking ground. At a Feb. 26 meeting, Newport Beach City Council members approved in a 6-1 vote a professional services agreement to retain Griffin Structures Inc. to provide construction management services for the project. “This is an exciting moment, as we bring Marina Park closer to fruition,” said Newport Beach deputy public works director Dave Webb.